A low output Moving Coil (LOMC) cartridge needs, in addition to the RIAA equalization, 20 to 30 times as much gain as a Moving Magnet (MM) cartridge. To get low current noise, a FET input stage is needed. To get low voltage noise, a BJT (ordinary transistor) input stage is needed. Given that LOMC and MM cartridges need different input stage technology, you can't just add more gain to your MM phono stage and call it a day. 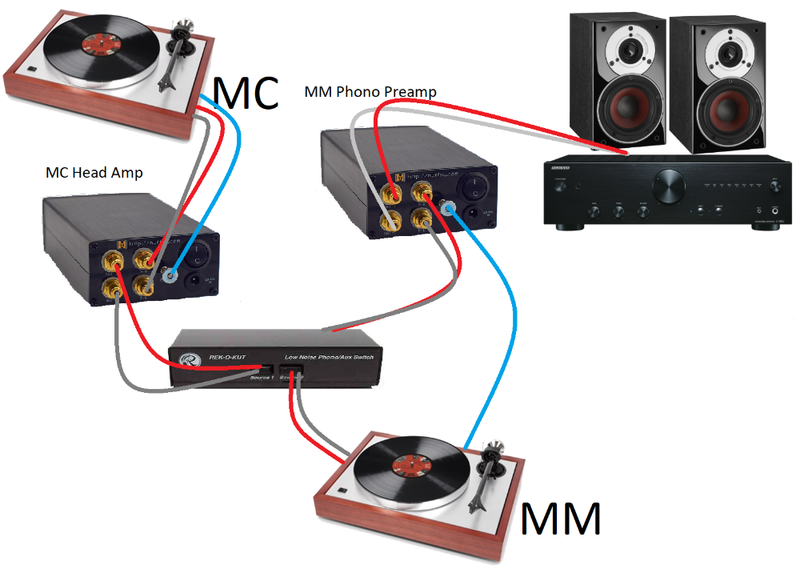 For MC, the signal needs to go from the turntable, through both the MC Head Amp and the Phono Preamp. Form MM, the signal needs to go through the Phono Preamp only. If you have built both the MC Head Amp and the Phono Preamp as described in the instructions (in separate B0905 cabinets), you can use a 2-to-1 (or an AB) signal switch to select between MC and MM. This will also work if you have two available signal inputs on your amplifier, just replace the AB-switcher in the picture below with your amplifier. 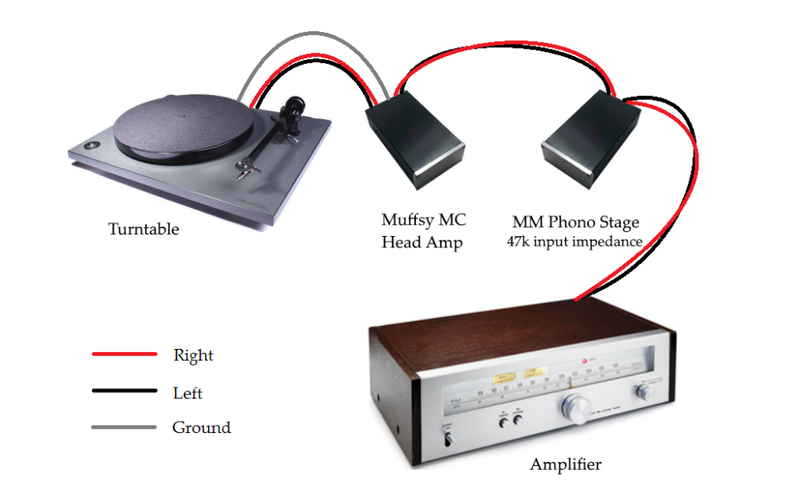 You can build the Muffsy Phono Preamp and the MC Head amp into the same enclosure (only one Muffsy Power Supply is needed for this), and switch between them. This requires your build to be in a larger enclosure, so you won't be able to use the Muffsy Back Panel. You'll need two sets of RCA inputs, and a ground screw, to switch between MM and MC. Use a 3PDT (three pole, dual throw) switch to select between the two inputs, and one set of RCA outputs.